Still locked away in her prison, Madame Xanadu peers across space and time at the destruction that is enveloping the world. Specifically what she sees are the superheroes of the world battling each other for control of Pandora's box, the cranial confinement of all that is wicked. The heroes are confronting Wonder Woman, who is under the box's control, fearing what doom a mindless, blood-lusting Amazon may bring to the world. With Superman still ill, and now lost somewhere in the ruins of ARGUS, it will take the return of Shazam to stand a chance against the Princess of Themyscira. Bad move, ultimately. Little more than a right cross from Shazam pummels Wonder Woman, allowing Shazam to get his hands on the box. With a great yawp of "SHAZAM!," the Big Red Cheese causes a rift across the magical spectrum, harming supernatural beings across the globe. Fortunately, this rift opened up the magical connection all these beings share, allowing Deadman, away in the House of Mystery with Batman and the JLA, to see the location of Xanadu. At the site where ARGUS once stood, Superman, Cyborg, Martian Manhunter, and the others stumble from the ruins, the headquarters having been blown up. 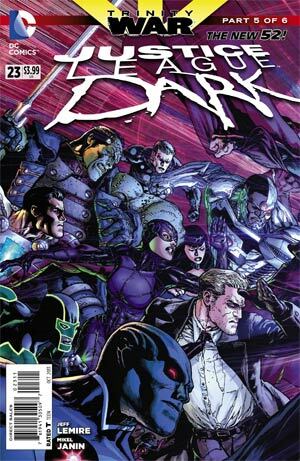 Distrust and blame aimed at Amanda Waller is mounting among the heroes, and things are getting heated. Superman, still weak, intervenes to compel his colleagues to search for survivors. Elsewhere, the combating group now have the task of taking on a Pandora's box-infused Shazam. The box exchanges several hands while Pandora, Zatanna, and Stargirl attempt to flee. Finally, that scoundrel and cheat, John Constantine arrives and takes hold of the box. Interestingly, the box has no adverse effects on Constantine. Pandora thought Superman in all his purity would be the only being able to withstand the pestilent evil of the box. She was wrong, of course, and each person to have since touched the box became a tool of the instrument's wickedness. Not Constantine, though. It turns out you can't corrupt the purely corrupted. Leaving the confusion and fighting behind, Constantine and Zatanna attempt to transport to London. The rift caused by the mingling of Shazam's magic with that of the box's distorts Constantine's transportation spell. The two end up at the ancient ruins of the Temple of Hephaestus in Greece. No mere coincidence, though, as they soon discover Xanadu shackled below the temple. Soon joined by the JLA demanding the box, Xanadu reveals a new secret: the box is a doorway, and the mastermind behind this whole catastrophe intends to open it. Where the door leads - or what will come out of it - we can be sure isn't good. Story - 2: I'm going to get a massive beef off my chest first. Justice League Dark is on my pull list. Ever since Lemire took over I've been following it, and so I anticipate taking the necessary dough out of my budget each month for the title. Each issue so far has been a pamphlet and so the price tag has remained steady at a penny under three bucks. Issue #23 is also a pamphlet, about 21 pages. But it was $3.99. 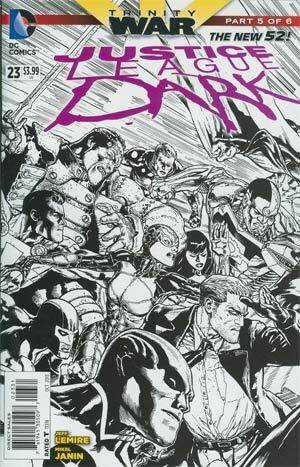 No comic book published by DC usually under 26 pages is more than $2.99. That's the line the company said it will hold. 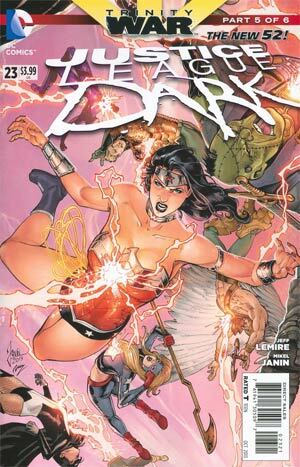 Why was JLD #23 a buck more than usual? Was it because it's part of the Trinity War? Maybe, we'll see with issue #24, but neither this issue, nor the whole arc has been worth a buck more, and I'm not willing to pay for it. Luckily, this story ends this week with Justice League and I don't have to fork out $3.99 for a pamphlet that up to this point has only ever cost $2.99. The story itself was little more than a beat 'em up. Think less Turtles in Time and more Double Dragon 3. Wait, there's tons of supernatural stuff involved, too. Okay, think less Ocarina of Time and more Hydlide. Hm... There are also guns. All right, think less Contra and more Duck Hunt. Ultimately, it was a bit of a snooze. The bit with Shazam was shoehorned in to allow an easy and ultimately inexplicable way for Deadman to find Xanadu. Does it matter that it's inexplicable, even though it's a magic-based story? Yes, it does. Magic is real in the DC Universe, and so it requires explanation and can't be used as a ready-made clamp for loose ends or as a bridge over plot holes. Why did Shazam's magic when coupled with the box's magic cause that rift? It may be explained later, and it really should be, but for now it just seems like magic was used as the crutch of convenience. This is most unfortunate when I consider who wrote this. Lemire is great at dark and supernatural flavored stories and he's usually cautious about letting magic go unexplained. In the end, this is a Geoff Johns story; he's driving this bus, and this lazy story point feels a lot like a Johns-ism. One point that rather bothered me was the splash page of the effects of Shazam melding with the box. It's suggested that it affected all the magical beings on Earth, and Deadman states that he was able to connect with them all. He even connected with Dr. Fate on Earth-2. My problem was the splash showed Swamp Thing and Animal Man. Neither Swampy nor Animal Man is magical. They are the avatars of two of three natural components that make up life and death in the DCU: the Green (all flora), the Red (all fauna), and the Rot (death, for which Abigail Arcane is the current avatar). While what each avatar does may seem supernatural, it's defined by the stories and origins as natural. It simply makes no sense that Swamp Thing and Animal Man were affected by the aforementioned flux of magic. Regarding our boy in blue, he only makes a small appearance in this issue, but it's very Superman-esque. Although he's in extreme pain, Superman takes control of the situation at ARGUS and calms everyone just enough so survivors could be searched for. Pure Supes. All in all, this was a fairly boring entry. While I'm very curious what this whole story is going to mean for the DC Universe, the ride to get there has been less than magical. Art - 4: Again, the art all around is nice to look at. There isn't much story to fill in the pages, so Janin had a lot of big panels to work with. It does the issue good and picks up the slack left dragging by the story. Cover Art - 3: Not too shabby, I guess. These all culminate into a larger picture and so it may be wiser to wait till then before any real judgment is made.